Rimjhim Aggarwal's research and teaching interests lie at the interface between sustainability science and international development. A central focus of her research has been on examining the links between globalization, resilience of social-ecological systems, and human well being. In current research she is examining the emerging conflicts in the framing of water as a human right as well as an economic, ecological and social good in rapidly urbanizing regions, with focus on Delhi, São Paulo and Johannesburg. She is also currently engaged in research projects examining the impacts of globalization and climate change on agricultural and water governance, farm livelihoods, and food security in India, Nepal, Thailand, and Arizona. 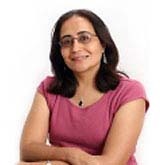 Professor Aggarwal has also worked as a senior consultant for the United Nations University's World Institute for Development Economics Research and the World Bank. In recognition of her efforts in "use-inspired research" and "community outreach," she was awarded the Arizona State University President's Award for Sustainability in 2010. Aggarwal, R. M. and L. Haglund. 2015. Deepening Our Understanding of Rights Realization through Disaggregation and Mapping. Closing the Rights Gap: From Human Rights to Social Transformation 265. Spielmann, K. A. and R. M. Aggarwal. 2017. Household vs. national-scale food storage: Perspectives on food security from archaeology and contemporary India. Pp. 244-271 In: Hegmon, M. ed., The Give and Take of Sustainability: Archaeological and Anthropological Perspectives on Tradeoffs. Cambridge University Press. ISBN: 9781107078338. Aggarwal, R. M. and L. Haglund. 2015. Deepening our understanding of rights realization through disaggregation and mapping: Integrating Census data and participatory GIS. Pp. 265-290 In: Haglund, L. and R. Stryker eds., Closing the Rights Gap: From Human Rights to Social Transformation. University of California Press. DOI: 10.1525/california/9780520283091.001.0001. ISBN: 978-0520283091. Aggarwal, R. M. and C. Taylor. 2015. Sustainable agricultural systems for cities. Pp. Chapter 8 In: Pijawka, K. D. ed., Sustainability in the 21st Century: Pathways, Programs, and Policies. Kendall Hunt Publishing Company. ISBN: 9781465266712. Aggarwal, R. M. and C. Taylor. 2012. Sustainable agricultural systems for cities. Pp. 185-206 In: Pijawka, K. and M. A. Gromulat eds., Understanding Sustainable Cities: Concepts, Cases, and Solutions. Kendall Hunt Publishing Company. Heinrichs, D., R. M. Aggarwal, J. Barton, E. Bharucha, C. Butsch, M. Fragkias, P. Johnston, F. Kraas, K. Krellenberg, A. Lampis, O. G. Ling and J. Vogel. 2011. Adapting cities to climate change: Opportunities and constraints. Pp. 193-224 In: Hoonweg, D., M. Freira, R. M. Lee, P. Bhada and B. Yuen eds., Cities and Climate Change: Responding to an Urgent Agenda. World Bank. Washington, D.C.
Iles, J., M. Holmes and R. M. Aggarwal. 2015. Price elasticity for residential water demand in the City of Goodyear. Poster presented at the Decision Center for a Desert City Annual Poster Symposium, April 27, 2015, Arizona State University, Tempe, AZ. Kaba, E., R. Aggarwal, S. Smith-Heisters and C. Rubinos. 2014. Decision making in irrigation districts under uncertainty. Poster presented at the Decision Center for a Desert City Annual Poster Symposium, April 28, 2014, Arizona State University, Tempe, AZ. Kaba, E., R. M. Aggarwal, S. Smith-Heisters and C. Rubinos. 2014. Decision making within irrigation districts in central Arizona. Poster presented at the Celebrating Honors Symposium of Research and Creative Projects, April 9, 2014, Barrett, The Honors College, Arizona State University, Tempe, AZ. Abrahams, R., R. M. Aggarwal and C. Taylor. 2010. Exploratory study on the spatial extent of locally oriented food production in Maricopa and Pinal Counties. Arizona State University, Tempe, AZ. Poster presented at the January 14, 2010 12th Annual Central Arizona Project Long-Term Ecological Project (CAP LTER) Poster Symposium, Global Institute of Sustainability. Taylor, C., R. M. Aggarwal, H. Eakin and K. A. Spielmann. 2010. Local food in the Phoenix metropolitan area: Barriers and enablers as perceived by food system stakeholders. Arizona State University, Tempe, AZ. Poster presented at the January 14, 2010 12th Annual Central Arizona-Phoenix Long-Term Ecological Research Poster Symposium, Global Institute of Sustainability. Aggarwal, R. M. 2016. Alternative visions for leveraging the food-water nexus for a sustainability transition: The Case of India. Presentation at the International Society for Ecological Economics (ISEE) Conference on Food, Water, Energy and Justice, June 27, 2016, Washington, D. C.
Aggarwal, R. M. 2016. Urbanization and Global Environmental Change: Research and Practice Connections for Liveable Cities. Presentation at the UN Habitat III: New Urban Agenda for the United Nations Conference on Housing and Sustainable Urban Development, October 19, 2016, Quito, Equador. Maciejewski, R., G. Mascaro, D. D. White, B. L. Ruddell, R. M. Aggarwal and H. Sarjoughian. 2016. Visual analytics for the food-water-energy nexus in the Phoenix active management area. Presentation at the American Geophysical Union Fall Meeting, December 14, 2016, San Francisco, CA. Aggarwal, R. M., M. Budruk, S. Bugental, I. Drower and B. Klimek. 2015. Cross cultural exchanges towards global change: Engaging youth with food and water challenges. Presentation at the Balance-Unbalance 2015 International Conference: Water, Climate, Place – Reimagining Environments, March 25-29, 2015, Tempe, AZ. Aggarwal, R. M. 2014. Regional development from the bottom-up. Presentation at the Global System Science Conference, Unpacking Green Growth: How Can It Become a New Lever to Accelerate Development in Poor Regions?, October 8, 2014, Tempe, Arizona and Lu'An, China. Aggarwal, R. M. 2013. Exploring the challenges of food-water-energy nexus. Presentation at the Adapting to a Water-Stressed West, American Association for the Advancement of Science Southwestern and Rocky Mountain Division (AAAS-SWARM) Water Forum, November 4, 2013, Tempe, AZ. Aggarwal, R. M. 2013. Leveraging the water-energy-food nexus for a sustainability transition: Institutional and policy design choices in a fragmented world. Presentation at the American Geophysical Union Fall Meeting, December 9-13, 2013, San Francisco, CA. Aggarwal, R. M. and J. M. Anderies. 2012. How we become victims of our own success: Case study analysis of exemplar social-ecological systems under globalization and climate change. Presented as part of a panel discussion When Strengths Can Become Weaknesses: Emerging Vulnerabilities in Exemplar Social-Ecological Systems under Globalization and Climate Change on May 29, 2012 at Adaptation Futures: Second International Climate Change. Fragkias, M., D. Heinrichs, R. M. Aggarwal, P. Johnston, J. Barton, A. Lampis and R. Krishnamurthy. 2012. Urban responses to climate change: evidence from practice in cities of the Global South. Presented March 28, 2012 at Planet Under Pressure: New Knowledge Towards Solutions, March 26-29, 2012, London, UK. Selover, N. J., R. M. Aggarwal, S. Waters and H. Eakin. 2012. Case critical: Are droughts withering our resources?. Panel discussion moderated by Climate Change Science Manager, Nalini Chhetri, Thursday, September 6, 2012, Arizona State University, Tempe, AZ. Bausch, J. C., R. M. Aggarwal and . Colleagues from couse SOS 594. 2010. Future scenarios of agriculture and water in central Arizona. Presentation at 17 February 2010 Decision Center for a Desert City: Water Climate Briefing, Arizona State University. Chuang, W. and R. M. Aggarwal. 2008. Governance of environmental impacts of high-tech industry in developing countries: Top-down versus. Presentation at the 5-6 April 2008 Science & Technology: An International, Interdisciplinary Graduate Student Conference, Washington, DC.